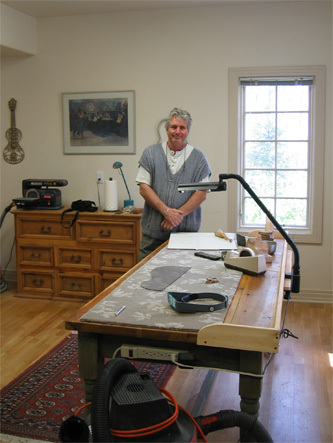 L arry Breslin, standing beside his primary work table in the Deerhead Guitars workshop. 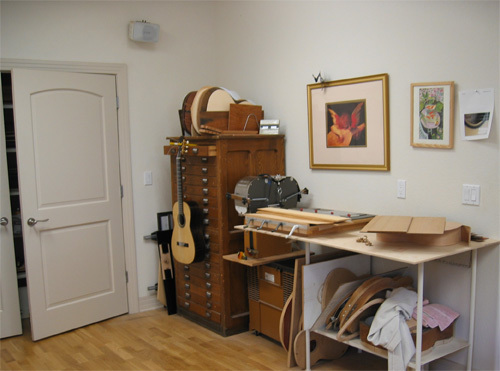 My visits have been a whirlwind education in the mysterious art of guitar making. Beside his superb guitars and extensive experience, I am especially impressed by Larry's intense curiosity and contributions to his craft. 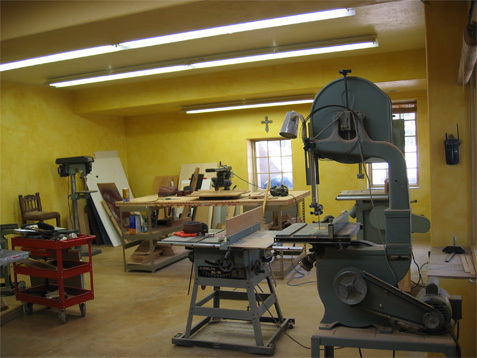 T his is the sawing and sanding room. It is filled with state-of-the-art hardware. His shop is extremely well organized and maintained. L ike music, I am amazed by the number of cutting, sanding and drilling tool variations! W e are now back in the work room. 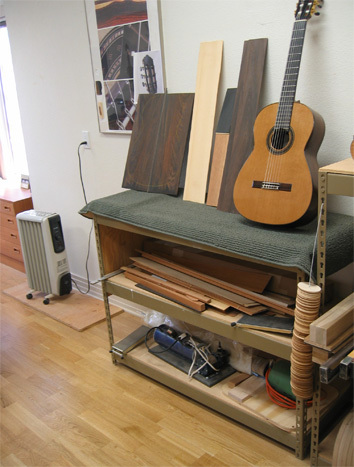 The instrument in the photo is the shop's cedar demonstration guitar. The blue compressor is used for vacuum clamping complex soundboard joins. Hanging on that wire are a stack of soundhole cut-outs, representing the number of instruments produced by Breslin's workshop over the past eight years. 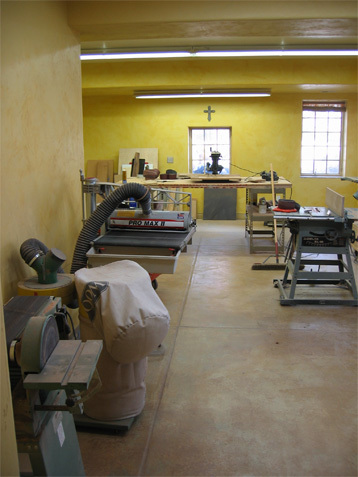 T he new spruce instrument in the corner is nearly finished. It is being French polished, a long and meticulous procedure. A tremendous selection of prepared woods from around the world are stored inside the partially open closet, including superb Engelmann spruce. Another curing area contains several billets in storage. Much of his Brazilian Rosewood stock has been air dried in storage for 40 years. Nearly everything is handmade in his workshop, including rosettes and purflings. The chest of drawers contain a myriad of woodworking tools, rosettes and bindings. A side-bending machine can be seen beside the chest; there are also a few traditional bending irons. For deeper coverage of Breslin's side-bending process, please visit my side bending page. 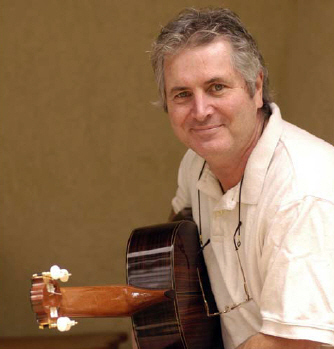 L arry Breslin is not Spanish-- his guitars are!